© Gosseries et al. ; Licensee Bentham Open. Non-communicative brain damaged patients raise important clinical and scientific issues. Here, we review three major pathological disorders of consciousness: coma, the unresponsive wakefulness syndrome and the minimally conscious state. A number of clinical studies highlight the difficulty in making a correct diagnosis in patients with disorders of consciousness based only on behavioral examinations. The increasing use of neuroimaging techniques allows improving clinical characterization of these patients. Recent neuroimaging studies using positron emission tomography, functional magnetic resonance imaging, electroencephalography and transcranial magnetic stimulation can help assess diagnosis, prognosis, and therapeutic treatment. These techniques, using resting state, passive and active paradigms, also highlight possible dissociations between consciousness and responsiveness, and are facilitating a more accurate understanding of brain function in this challenging population. Keywords: Coma, EEG, fMRI, minimally conscious state, neuroimaging, PET scan, unresponsive wakefulness syndrome. Patients with disorders of consciousness occurring after a coma represent a major challenge in clinical practice and experimental research. Patients in coma may die, fully recover consciousness, or evolve into some intermediate states such as the unresponsive wakefulness syndrome (UWS) or the minimally conscious state (MCS). Most patients continuously improve and recover some functional abilities, but some remain in a state with disorder of consciousness for several years or even permanently. These patients are, by definition, not able to communicate, and present important motor deficits, sensory losses, language impairment and vigilance fluctuation. Clinical evaluation can therefore be difficult and may lead to a high rate of misdiagnosis. Despite this, behavioral assessment currently remains the gold standard in the diagnostic work-up. The neuroimaging techniques recently developed have brought new insights on brain function after a coma and can complement the clinical assessment by improving the diagnosis and prognosis of patients with disorders of consciousness. Neuroimaging tools are also starting to be employed to examine the effects of some therapeutic interventions. This review briefly discusses the different disorders of consciousness following a period of coma and reviews recent clinical and neuroimaging findings concerning their diagnosis, prognosis and therapeutic treatment. Coma is an acute state of unresponsiveness in which a patient cannot be aroused. Diagnosis of coma is primarily based on clinical examination of the eyes . If the patient is able to open the eyes either spontaneously or after stimulation, (s)he is not in a coma. This state lasts at least one hour and rarely lasts longer than two to four weeks. The cause of coma can be investigated through specific respiratory patterns, temperature changes, increased or decreased blood pressure, modification of the skin, abnormalities of the neurological examination and neuroimaging scanners. Coma has multiple etiologies but it is usually divided into traumatic (e.g., motor accident, fall) and non-traumatic (e.g., cardiac arrest, drowning, carbon monoxide poisoning) etiologies. Coma originates from diffuse axonal injury and extensive bilateral hemisphere lesions or from focal lesion in the brainstem or bilateral thalami, which provokes a global impairment of the arousal system . Patients with UWS show signs of arousal: they open their eyes either spontaneously or when stimulated . Post-mortem analysis reveals that the brainstem and hypothalamus, and specifically the reticular activating system, are largely restored, which explains why patients look awake. The term “unresponsive wakefulness syndrome” has recently replaced the term “vegetative state” because it has no pejorative connotations and it is a more precise description of the clinical state . Patients in UWS present various reflexive responses to external stimuli (such as yawning and grunting) but they do not show any overt sign of awareness . They also exhibit a relatively preserved sleep-wake cycle but recent studies suggest an absence of defined electrophysiological characteristics of sleep [6, 7]. The UWS is usually due to widespread lesions of grey matter in the neocortex and thalamus, widespread white matter damage and diffuse axonal injury, and/or bilateral thalamic lesions . Patients who present behaviors that are clinically regarded as indicators of consciousness, such as visual pursuit, intelligible verbalizations or responses to command, are considered as having entered the MCS (Fig. 1). These patients must show reproducible signs of consciousness even if it is minimal and fluctuating, in conjunction with the absence of functional communication and object use . This state has been subcategorized as MCS+ and MCS- based on the presence or absence of language comprehension respectively . This recent classification is supported by neuroanatomical data that demonstrates better preservation of language-related networks in MCS+ as compared to MCS- patients . More recently, the non-behavioral MCS (abbreviated as MCS*) has been proposed for patients who do not demonstrate any behavioral sign of consciousness at the bedside but the neuroimaging results are compatible with consciousness, for example when a patient shows consistent brain activation during mental imagery tasks [11, 12] (Fig. 2). Note that the terms “functional MCS” and “functional locked-in syndrome” have also been proposed for this category of patients but they hold ambiguity and could lead to unwarranted confusion given the fact that MCS patients are unable to functionally communicate, and the locked-in syndrome is not a disorder of consciousness [13, 14]. Nosology and evolution after a severe brain injury. UWS, unresponsive wakefulness syndrome; MCS, minimally conscious state. Adapted from . Once patients show functional communication or object use, they emerge from the MCS . Further recovery is still possible, although cognitive deficits and functional impairment are very likely. The locked-in syndrome is another condition where patients are locked inside their body. They are able to fully perceive their environment but they are extremely limited at the motor level . They have no means of producing speech, limb, or face movements, and the anatomy of the responsible lesion in the brainstem (i.e., disruption of the corticospinal and corticobulbar pathways) is such that these patients are only left with the capacity to use vertical eye movements and blinks to communicate. Their cognitive capacities are usually well preserved even if recent studies reported impairment in recognition of negative facial expressions, motor imagery defects, and pathologic laughter and crying [17- 21]. 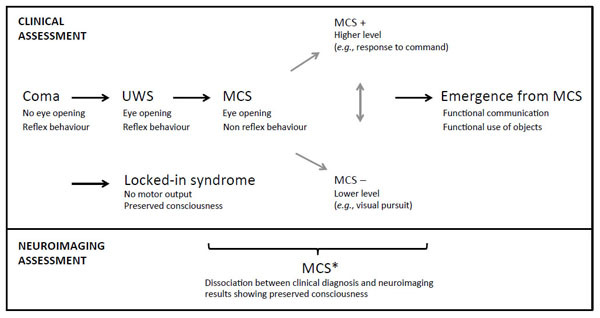 Note that the emergence of MCS and the locked-in syndrome are not considered as being part of the disorders of consciousness because consciousness is preserved in these states. Fig. (1) displays the trajectory after a severe brain injury and the possible states according to clinical and neuroimaging examinations. Making the correct diagnosis has important implications. For example, the prognosis of patients in MCS is often better than the one of UWS [22, 23]. MCS patients also seem to show greater responses to some treatments . Moreover, access to a rehabilitation center is sometimes determined by the diagnosis, as patients have to be able to participate in the treatment plan. Being considered conscious (or unconscious) thus greatly influences caregivers in regard to rehabilitation process but also in end-of-life decision-making. The clinical standard to assess the level of consciousness is based on bedside behavioral examination, by mainly looking for a motor response to a command. Misdiagnosis is disturbingly frequent (up to 40%) when based exclusively on clinical consensus [25-27]. Some of the factors on the patient’s side that account for misdiagnosis are motor impairment, sensory deficit, altered cognition, fluctuation of vigilance and medical complications [28, 29]. On the assessor’s side, the lack of knowledge regarding the disorders of consciousness, poor training and non-use of adequate behavioral scales are also some elements contributing to the high rate of misdiagnosis. Poorly trained examiners can dramatically mistake patients with locked-in syndrome for unconscious patients especially when a bilateral ptosis or the presence of an opsoclonus-myoclonus syndrome further reduces the motor repertoire of the former [30-32]. Neuroimaging assessments in two patients behaviorally diagnosed as UWS. The patient on the left presents the typical pattern of UWS (i.e., low brain metabolism as shown in blue with FDG-PET, no resting state default mode network, severe atrophy of the white matter tracts as shown with DTI, and no brain activation during motor and spatial imagery tasks). The patient on the right presents a pattern not compatible with UWS, and should hence be diagnosed as MCS*. 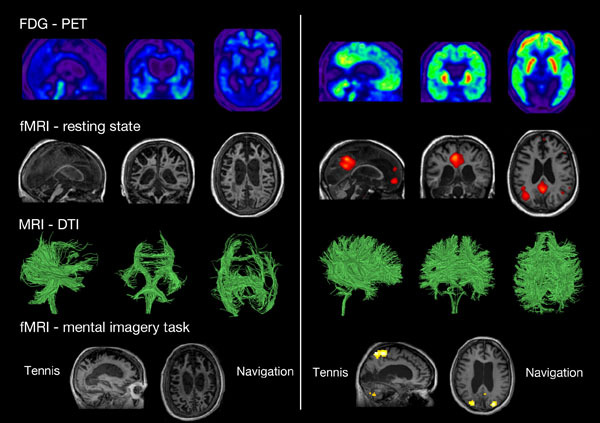 FDG-PET: fluorodesoxyglucose-positron emission tomography, fMRI: functional magnetic resonance imaging, here the resting state is the default mode network. DTI: diffusion tensor imaging. Taken from . Multiple behavioral scales have been developed to help the bedside assessment. The Coma Recovery Scale-Revised is recommended, as it has been specifically developed to differentiate between UWS and MCS patients [25, 33]. The use of a mirror to assess visual fixation/pursuit, and the use of the patient’s own name to assess auditory localization are also advised [34-37]. Beside the diagnosis of the level of consciousness, the presence of multiple comorbidities should also be taken into account in the establishment of the prognosis . Other factors influencing the prognosis are the age , the etiology of the brain injury , the time since onset , the presence or absence of brainstem reflexes , and the electrophysiological and neuroimaging results that will be discussed in the next sections. Despite the most accurate clinical assessment, one cannot however rule out some degree of awareness in some patients. In fact, neuroimaging studies have now demonstrated that several patients who are completely unresponsive at the bedside present patterns of brain activation similar to those observed in healthy participants [42, 43] (Fig. 2). Neuroimaging techniques allow straightforward measurements of brain activity without patient participation and without using a motor interface that may help improving the diagnosis and prognosis of patients with disorders of consciousness. The most employed techniques in the field of disorders of consciousness are currently positron emission tomography (PET), functional magnetic resonance imaging (fMRI), electroencephalography (EEG), and transcranial magnetic stimulation (TMS) [44, 45]. Different paradigms have been used in the recent years and can be classified into three categories: 1) resting state paradigms to investigate the patients’ brain activity at rest; 2) passive paradigms with the administration of external stimuli such as auditory beeps or visual flashes; and 3) active paradigms to detect willful modulations of brain activity. Resting state and passive paradigms do not require the collaboration of the patients, except that they have to stay awake. Active paradigms allow obtaining a response to command bypassing motor output. We will next review the different neuroimaging techniques and provide a summary of what have been found regarding the diagnosis and the prognosis of patients with disorders of consciousness. PET studies measure resting regional cerebral metabolic rates for glucose or changes in regional cerebral blood flow as an indirect measure of the neural synaptic activity . For example, a PET scan using fluorodeoxyglucose (18F) summates approximately 30 minutes of cerebral glucose metabolism and allows assessment of regional variations. PET scanning is invasive because it involves the injection of positron-emitting radionuclides with short half-lives. As the radioactive compound accumulates in different regions of the brain and positron annihilations occur, the scanner detects the coincident rays produced at all positions outside the head and reconstructs an image that displays the location and concentration of the radioisotope within a plane of the brain. PET is combined with CT imaging to co-register the functional PET image with a high anatomic resolution image. Early resting state studies using fluorodeoxyglucose PET showed that brain glucose metabolism in coma and UWS decreases to about 40% of normal in the acute phase , and decreasing further to around 30-40% of normal in the chronic stages of UWS . In MCS patients, the average brain activity is generally maintained at 50-70% of normal, and in patients with locked-in syndrome it is decreased by 10% with dysfunction only in the infratentorial regions . Progression from UWS to MCS becomes increasingly likely at global metabolic levels above ~45% of normal, while maintenance of consciousness below this metabolic level is rare . The decreased metabolism in UWS and MCS patients is most noticeable in the precuneus, the posterior cingulate and the temporo-parietal junction . In a single case report, recovery from UWS was associated with the restoration of functional connectivity between intralaminar thalamic nuclei, prefrontal and anterior cingulate cortices . More recently, patients in UWS have been shown to demonstrate metabolic dysfunction in extrinsic (i.e., lateral frontoparietal cortices related to external awareness) and intrinsic (i.e., midline network related to internal awareness) networks as well as in thalami, whereas MCS patients only show dysfunction in the intrinsic network and thalami . Additionally, MCS+ patients showed preserved metabolism in language and sensorimotor areas as compared to MCS- patients . In another recent study, the differences of regional metabolic change between MCS and UWS patients were most pronounced in the frontoparietal, sensory, and motor cortices, whereas no subcortical structures were differentially affected . The utility of PET scan has been recently demonstrated in a sample of 126 patients when detecting conscious brain activity based on the preservation of frontoparietal networks. Full or partial preservation of frontoparietal glucose metabolism was associated with the presence or imminent recovery of responsiveness after severe brain injury, while complete metabolic suppression of the frontoparietal cortex was indicative of unresponsiveness without long-term recovery (Fig. 3). The technique allowed to correctly identify 93% of MCS patients and correctly predict consciousness recovery in 74% of patients with disorders of consciousness . In the same line, a preliminary study in patients with disorders of consciousness using [11 C] Flumazenil PET reported reduced global GABA-A receptor binding and decreased local-to-global ratio in the supragenual anterior cingulate that correlated with behavioral improvement after three months . Glucose metabolism at rest in minimally conscious state (MCS) and in unresponsive wakefulness syndrome (VS/UWS). Blue represents areas with low metabolism and red represents areas with preserved metabolism when compared to healthy participants. Adapted from . Finally, early H2(15)O-PET studies using passive paradigms showed that UWS patients typically only activate primary sensory cortices in response to painful stimulations or auditory stimuli [53, 54]. In contrast, MCS patients show preserved higher order areas activation, encompassing frontoparietal cortices [55, 56]. Functional MRI can detect an increase in blood oxygen concentration that occurs in an area of heightened neuronal activity. The most common form of MRI is blood oxygenation level dependent (BOLD) imaging . The BOLD signal depends on the ratio of oxygenated to deoxygenated hemoglobin. The localized changes induced by neuronal activity cause increases in magnetic resonance signal, which are used as indices of functional activation. These changes in signal are then mapped onto a scan of the participant's anatomy. Drawbacks of the MRI are the claustrophobia that some participants may experience, the susceptibility to subjects’ movement artifacts and the interdiction of metal-containing devices in the magnet. A number of functional MRI studies have focused on the measurement of resting state spontaneous BOLD signal correlations between brain regions . These studies identified preserved functional connectivity in both lateral and medial frontoparietal areas in MCS patients as compared to UWS patients [59-63]. More recently, various resting state networks such as the default mode, frontoparietal, salience, auditory, sensori-motor and visual networks have been used to discriminate UWS from MCS patients with a high discriminative capacity (>80%) (Fig. 4). In particular, the auditory-visual interaction, supported by the auditory network, had the highest classification accuracy (91%) . 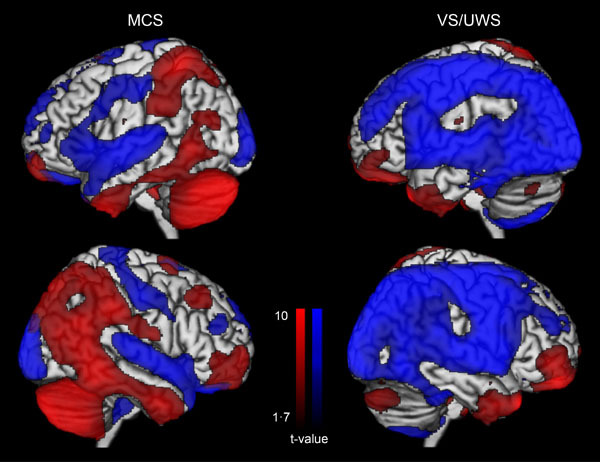 Another recent study also showed that functional connectivity in the salience network was reduced in UWS as compared to MCS. The connectivity within the default mode network was also lower in patients who showed no improvement as compared to those who recover consciousness three months after the scanning, suggesting that the default mode network can predict recovery of consciousness . In a last study, intrinsic functional connectivity strength was primarily reduced with loss of consciousness in the posterior cingulate/precuneus, medial prefrontal cortex, and lateral parietal cortex. These patterns of decreased connectivity could predict whether patients with coma and UWS would regain consciousness with an accuracy of 81%, with the most discriminative region being the precuneus . Resting state connectivity networks across healthy participants, patients in minimally conscious state (MCS), unresponsive wakefulness syndrome (UWS) and coma. For each network, a decrease is observed as a function of the level of consciousness. Taken from . Functional MRI studies have also measured changes in BOLD signal during external stimulations as compared to a resting state baseline. These passive paradigms gave similar results to those obtained in PET studies reviewed above. Most UWS patients only display low-level cortices activation in response to sensory stimuli [67, 68]. In contrast, MCS patients usually recruit a more widespread set of associative cortices. Default mode network deactivation also seems more preserved in MCS patients as compared to UWS . Moreover, default mode network activation in response to self-referential stimuli has been shown to be stronger in MCS as compared to UWS patients [61, 70]. The BOLD signal in auditory cortex elicited by the patient’s own name spoken by a familiar voice has also been shown to reliably predict the outcome in UWS patients. Specifically, 92% of traumatic UWS patients with activation of higher order auditory cortices had a good outcome, whereas 85% of non-traumatic UWS patients with low activation in auditory cortex did not recover after one year . Finally, active functional MRI paradigms have been used as brain computer interfaces to detect behaviorally UWS patients with covert cognition (i.e., MCS* patients, see Fig. 2). The first well-known case was a traumatic UWS patient in 2006 who was put in the scanner and asked to imagine playing tennis and imagine navigating through her house. The patient showed brain activation patterns of the appropriate cortical brain regions (i.e., supplementary motor cortex for motor imagery and parahippocampal regions for spatial imagery), exactly like healthy participants . Since then, many studies have reported similar results using other paradigms such as attentional task  and even passive viewing of a movie . Mental imagery examinations have also predicted recovery of consciousness , and have been employed to communicate with a patient in MCS . Note, however, that these active paradigms only work in a minority of patients [27, 75, 76]. EEG is a non-invasive technique that permits to measure directly spontaneous brain electrical activity via electrodes attached to the scalp. EEG provides temporal resolution in the millisecond range (PET and MRI provide good spatial resolution in millimeters but lower temporal resolution in seconds). The EEG has the advantage of being transportable and can be employed at the bedside. The EEG represents the passive conduction of currents produced by summating activity over large neuronal aggregates. An evoked potential is the time-locked average of the EEG in response to a sensory, motor or cognitive event. Because of their low amplitude, a number of stimuli have to be averaged . Sensory evoked or ‘exogenous’ potentials are elicited by specific sensory pathways (e.g. visual evoked potentials). Event-related or ‘endogenous’ potentials are related to the mental attention of the participant and to cognitive aspects of detecting a target stimulus . Resting state EEG studies reported lower delta power and less frequent high delta power microstates in MCS as compared to UWS patients [79-81]. Reduced EEG amplitudes and delta frequencies have also been shown to correlate with bad clinical outcomes, whereas alpha frequencies and EEG reactivity correlated with good outcomes . Reducing the raw EEG into one number, using for example the bispectral index or the spectral entropy, MCS patients showed higher values than UWS patients [83, 84]. In a recent study on a large cohort of patients using different EEG indices, low-frequency power, EEG complexity, and information exchange were the most reliable signatures of consciousness . Moreover, patients in MCS demonstrated preserved EEG sleep-wake patterns as compared to UWS patients , and functional connectivity EEG studies have suggested a link between preserved cerebral functional interactions and higher conscious level in MCS as compared to UWS patients [86, 87]. Using passive paradigms, the mismatch negativity (an early negative waveform elicited by a deviant tone in a repetitive series) was more often observed in MCS than in UWS patients [88-90]. Using a mismatch negativity paradigm, it has also been shown that the only difference between UWS and MCS patients was a deficit of feedback connection from frontal to temporal cortices . In addition, the P300 is also an event related that have been more consistently observed in MCS than in UWS patients [92, 93]. Recently, the capacity of patients to detect violations of local (e.g., four low tones followed by a high tone) and global (e.g., a sequence of five low tones following three sequences in which four low tones are followed by a high tone) regularities has been explored using auditory stimuli. Although violations of local regularity could be detected unconsciously, responses to global auditory novelty could differentiate MCS from UWS patients . The presence or absence of auditory event-related potentials (e.g., N100, P300, N400, mismatch negativity) and somatosensory evoked potentials (e.g., bilateral N20) have been shown to hold prognostic value [95-100]. Similarly, initial visual evoked potentials have recently been related to long-term outcome . As in fMRI, EEG active paradigms (e.g., counting the occurrence of own name in a sequence of names, imagining squeezing hands) have also allowed identifying MCS* patients who responded to verbal command using their brain activity [102, 103]. Finally, linear and nonlinear analyses of the EEG signals in UWS patients have been proposed to investigate signs of decreased complexity and mutual interconnectivity within the consciousness-related networks in order to improve our ability to predict outcomes [104-107]. TMS allows stimulating non-invasively the superficial cortex. A brief, high-current pulse is produced in a coil of wire, which is placed above the scalp. A magnetic field is produced with lines of flux passing perpendicularly to the plane of the coil and an electric field is induced perpendicularly to the magnetic field. The extent of neuronal activation varies with the intensity of stimulation. Stimulations can be used via single, paired or repetitive pulses. Single-pulse TMS does not produce long-term changes (as compared to repetitive TMS) and is used to measure the effect of a perturbation and to induce short-term changes without modifying the brain activity . TMS combined with high-density EEG allows to precisely perturb a selected brain area and to record cortical responses locally and at distant sites in a reliable and reproducible way [109-111]. TMS-EEG does not require any participation of the patient and does not require motor output or language comprehension, which is an appealing approach to study patients in disorders of consciousness. In UWS patients, TMS has been shown to typically trigger a stereotypical slow wave that remains local, as it is also the case in non-rapid eye movement sleep and in general anesthesia. 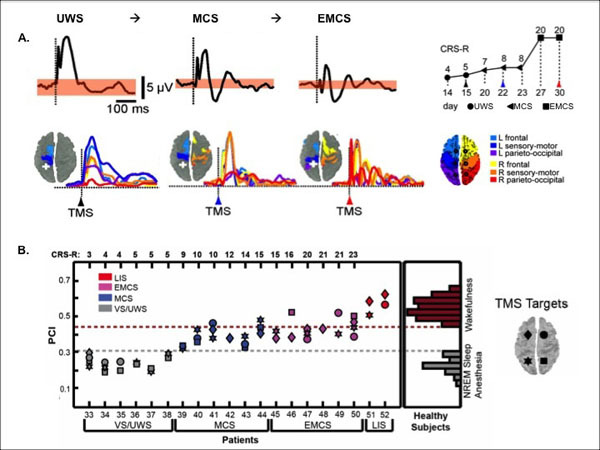 In contrast, brain activation patterns to TMS in MCS patients have been reported to be widespread and differentiated, as observed in healthy awake participants, in patients who emerged from the MCS and in locked-in patients [112, 113] (Fig. 5). Interestingly, TMS-EEG seems to give a clear-cut difference at the individual level. These results are, however, descriptive and one may want to be able to quantify these responses, especially if used in the clinical settings. In that context, the perturbational complexity index (PCI) was developed by calculating the spatial and temporal response of the brain to a perturbation induced by TMS, which gives a number between 0 and 1 . Results showed that PCI can successfully differentiate between conscious and unconscious states: it is high in healthy awake participants, in MCS patients and in locked-in, and it is low in patients in UWS, under general anesthesia (e.g., propofol, xenon, midazolam) and during non-rapid eye movement sleep (Fig. 5). TMS-EEG Discriminates Between UWS and MCS. A. Descriptive brain responses to TMS in a UWS patient who evolved to MCS and to EMCS. Response under the TMS stimulation (top figure, black trace) and the following spreading of the activity in the brain (colors represent the location of the brain areas). White cross displays the site of the TMS stimulation (parietal cortex). The behavioral recovery was assessed with the Coma Recovery Scale-Revised (CRS-R). B. Quantitative brain responses to TMS in UWS, MCS, emergence of MCS and locked-in patients.The perturbational complexity index (PCI) progressively increases from UWS to MCS and exit MCS. PCI attains levels of healthy awake participants in locked-in patients whereas UWS show similar value as non-rapid eye movement sleep (NREM) and anesthesia in healthy participants. The threshold for consciousness is 0.31. Adapted from [112, 114]. There are currently only a few evidence-based guidelines regarding the treatment of patients with disorders of consciousness, and even less neuroimaging studies on the effect of therapeutic treatment. So far, treatments that have shown some positive responses include pharmacological agents, such as amantadine , apomorphine , zolpidem [117, 118] and baclofen , and brain stimulations, such as transcranial direct current stimulation [24, 120], TMS [121, 122] and deep brain stimulation . One PET study showed an increase in metabolism in the frontoparietal network of a chronic anoxic MCS patient after the administration of amantadine, which resulted in cognitive and motor improvements . A few other PET studies reported that zolpidem-related functional recovery was paralleled by an increase in glucose metabolism in prefrontal cortices [125-127]. A zolpidem-related increase in metabolism in thalamic and striatal regions was also observed in some studies but not all . Interestingly, none of the responders presented structural lesions on the brain areas showing increased metabolism after zolpidem. Activation of EEG cortical activity has also been reported after zolpidem uptake in a UWS patient . More specifically, responders seem to present an increase in power at 15–30 Hz associated with an attenuation of 6–10 Hz power after zolpidem administration . Note that zolpidem responders are rare, in the order of 5% of patients with disorders of consciousness . The “GABA impairment hypothesis” was recently proposed by Pistoia and colleagues to explain the effect of zolpidem on recovery of consciousness: zolpidem may act on the recovery of consciousness by reversing the impairment of GABA, and hence, by restoring normal ratio between synaptic excitation and inhibition . Another hypothesis is the "mesocircuit model" which suggests that zolpidem disinhibits the globus pallidus interna and hence increases the thalamic excitatory role on prefrontal cortices . The clinical and scientific community has recently shown an increasing interest for brain stimulations as a therapeutic tool for patients in disorders of consciousness. The few studies published so far reported an improvement of the level of consciousness in some MCS patients, following a single session as well as repetitive sessions of transcranial direct current stimulation on the dorsolateral prefrontal cortex [24, 120]. Interestingly, MCS responders showed more grey matter preservation and residual metabolic activity in the stimulated brain region but also in the precuneus and in the thalamus, when compared to non-responders, which suggests a widespread effect of the technique, allowing functional improvement in some MCS patients . Repetitive TMS has also been employed to induce positive effect in some patients with disorders of consciousness but some studies did not find any behavioral improvement. In a single case report, along with meaningful behaviors, a MCS patient showed increases in alpha, beta and delta gamma power of the EEG after repetitive TMS on the motor cortex . Similarly, reappearance of fast EEG activity and increase in slow waves was reported in a MCS patient who showed transitory arousal after 20Hz repetitive TMS over the motor cortex . On the other hand, a recent study did not find any behavioral or electrophysiological effect of 20Hz TMS on motor cortex in 11 patients in UWS . Finally, in a seminal study, bilateral deep brain electrical stimulation of the central thalamus has been shown to modulate behavioral responsiveness in a patient who remained in MCS for six years before the intervention . Since then, other patients with disorders of consciousness showed increased functional communication, motor performance, feeding, and object naming during and after central thalamic deep brain stimulation protocols . Additionally, some patients also recovered from the UWS after the stimulation of the mesencephalic reticular formation, and this paralleled desynchronization on continuous EEG frequency analysis. Regional cerebral blood flow and regional cerebral metabolic rate of oxygen also increased at the whole brain level during the stimulation . These findings indicate that deep brain stimulation protocols have therapeutic potential to improve behavioral functioning in patients with disorders of consciousness. More behavioral and neuroimaging studies are nevertheless needed to address the role of electrophysiological treatment strategies in these patients [for a comprehensive review, see 136]. Patients with disorders of consciousness pose important diagnostic, prognostic and therapeutic challenges. Innovative neuroimaging approaches have been developed to decrease misdiagnoses and to increase confidence in predicting outcome. Individual neuroimaging results may have major consequences on how the caregivers behave with the patients once, for example, they know they are (minimally) conscious, or that they have a better prognosis than initially expected. This might also affects the treatment management and ethical decisions. Neuroimaging findings mainly suggest that MCS patients (including MCS*) present more preserved brain activity as well as more multisensory integration and top-down processing as compared to UWS patients. Studies also show that the prognosis is tightly linked to neuroimaging results: the more the brain is shown to be active, the better is the prognosis. Currently, the most robust technique for diagnosis seems to be the fluorodeoxyglucose PET scan . However, it is radioactive and expensive. Combining multiple neuroimaging assessments are therefore suggested as it increases the chance to provide an accurate diagnosis and prognosis. Neuroimaging results should only be considered at the clinical level in case of an absence of consciousness at the bedside (i.e., UWS patient) and in case of positive neuroimaging results (e.g., during active paradigms). Advances in curative treatment for patients with disorders of consciousness have been made recently. In the next years, we should primarily focus on improving therapeutic treatments but, for now, we advise to try as many options as possible (pharmacological medications and brain stimulations). Future neuroimaging studies should attempt to pre-identify responders to develop better individualized therapies, and to better understand the relationship between behavioral recovery, brain processing and treatment. Future work should also aim at testing the validity of the reviewed neural markers of consciousness both for diagnosis and prognosis in large-scale clinical trials. Finally, the next focus should be on developing a single wieldy index of consciousness that could supplement the current clinical assessments and pave the way for neurointensive and rehabilitation care. This research was supported by the Belgian National Funds for Scientific Research (FNRS), the Belgian American Education Foundation, the Wallonie-Bruxelles International, the European Commission, the Fonds Léon Fredericq, the James McDonnell Foundation, the Mind Science Foundation, the French Speaking Community Concerted Research Action (ARC-06/11-340) and the University and University Hospital of Liège. Posner JB, Saper CB, Schiff ND, Plum F. Plum and Posner's diagnosis of stupor and coma. Oxford: Oxford University Press 2007. Laureys S. Eyes open, brain shut. Sci Am 2007; 296(5): 84-9. Plum F, Posner JB. The diagnosis of stupor and coma. Contemp Neurol Ser 1972; 10: 1-286. Medical aspects of the persistent vegetative state (1). The Multi-Society Task Force on PVS. N Engl J Med 1994; 330(21): 1499-508. Cologan V, Drouot X, Parapatics S, et al. Sleep in the unresponsive wakefulness syndrome and minimally conscious state. J Neurotrauma 2012; 30(5): 339-46. Landsness E, Bruno MA, Noirhomme Q, et al. Electrophysiological correlates of behavioural changes in vigilance in vegetative state and minimally conscious state 2011; 134(8): 2222-32. Bruno MA, Vanhaudenhuyse A, Thibaut A, Moonen G, Laureys S. From unresponsive wakefulness to minimally conscious PLUS and functional locked-in syndromes: recent advances in our understanding of disorders of consciousness. J Neurol 2011; 258(7): 1373-84. Bruno MA, Majerus S, Boly M, et al. Functional neuroanatomy underlying the clinical subcategorization of minimally conscious state patients. J Neurol 2012; 259(6): 1087-98. Vogel D, Markl A, Yu T, Kotchoubey B, Lang S, Müller F. Can mental imagery functional magnetic resonance imaging predict recovery in patients with disorders of consciousness? Arch Phys Med Rehabil 2013; 94(10): 1891-8. Gosseries O, Di H, Laureys S, Boly M. Measuring consciousness in severely damaged brains. Annu Rev Neurosci 2014; 37: 457-78. Formisano R, Pistoia F, Sarà M. Disorders of consciousness: a taxonomy to be changed? Brain Inj 2011; 25(6): 638-9. Gosseries O, Zasler ND, Laureys S. Recent advances in disorders of consciousness: focus on the diagnosis. Brain Inj 2014; 28(9): 1141-50. Giacino JT, Kalmar K, Whyte J. The JFK Coma Recovery Scale-Revised: measurement characteristics and diagnostic utility. Arch Phys Med Rehabil 2004; 85(12): 2020-9. Laureys S, Pellas F, Van Eeckhout P, et al. The locked-in syndrome : what is it like to be conscious but paralyzed and voiceless? Prog Brain Res 2005; 150: 495-511. Conson M, Sacco S, Sarà M, Pistoia F. Selective motor imagery defect in patients with locked-in syndrome. Neuropsychologic 2008; 46(11): 2622-8. Sacco S, Sarà M, Pistoia F. Management of pathologic laughter and crying in patients with locked-in syndrome: a report of 4 cases. Acch Phys Med Rehabil 2008; 89(4): 775-8. Conson M, Sarà M, Pistoia F. Recognition and mental manipulation of body parts dissociate in locked-in syndrome. Brain cogn 2010; 73(3): 189-93. Babiloni C, Sarà M, Pistoia F. Resting state eyes-closed cortical rhythms in patients with locked-in-syndrome: an EEG study. Clin Neurophysiol 2010; 121: 1816-24. Luauté J, Maucort-Boulch D, Tell L, et al. Long-term outcomes of chronic minimally conscious and vegetative states. Neurology 2010; 75(3): 246-52. Noe E, Olaya J, Navarro MD, et al. Behavioral recovery in disorders of consciousness: a prospective study with the Spanish version of the Coma Recovery Scale-Revised 2012. Thibaut A, Bruno MA, Ledoux D, Demertzi A, Laureys S. tDCS in patients with disorders of consciousness: sham-controlled randomized double-blind study. Neurology 2014; 82(13): 1112-8. Schnakers C, Vanhaudenhuyse A, Giacino J, et al. Diagnostic accuracy of the vegetative and minimally conscious state: clinical consensus versus standardized neurobehavioral assessment. BMC Neurol 2009; 9: 35. Gill-Thwaites H. Lotteries, loopholes and luck: misdiagnosis in the vegetative state patient. Brain Inj 2006; 20(13-14): 1321-8. Stender J, Gosseries O, Bruno MA, et al. Diagnostic precision of PET imaging and functional MRI in disorders of consciousness: a clinical validation study. Lancet 2014; 384(9942): 514-22. Schnakers C. Clinical assessment of patients with disorders of consciousness. Arch Ital Biol 2012; 150(2-3): 36-43. Whyte J, Nordenbo AM, Kalmar K, et al. Medical complications during inpatient rehabilitation among patients with traumatic disorders of consciousness. Arch Phys Med Rehabil 2013; 94(10): 1877-83. Pistoia F, Sarà M. Is there a cartesian renaissance of the mind or is it time for a new taxonomy for low responsive states? J Neurotrauma 2012; 29(13): 2328-31. Pistoia F, Sarà M. Gabapentin therapy for ocular opsoclonus-myoclonus restores eye movement communication in a patient with a locked-in syndrome. Neurorehabil Neurel Repair 2010; 24: 493-. Seel RT, Sherer M, Whyte J, et al. Assessment scales for disorders of consciousness: evidence-based recommendations for clinical practice and research. Arch Phys Med Rehabil 2010; 91(12): 1795-813. Vanhaudenhuyse A, Schnakers C, Brédart S, Laureys S. Assessment of visual pursuit in post-comatose states: use a mirror. J Neurol Neurosurg Psychiatry 2008; 79(2): 223. Thonnard M, Wannez S, Keen S, et al. Detection of visual pursuit in patients in minimally conscious state: a matter of stimuli and visual plane? Brain Inj 2014; 28(9): 1164-70. Cheng L, Gosseries O, Ying L, et al. Assessment of localisation to auditory stimulation in post-comatose states: use the patient’s own name. BMC Neurol 2013; 13: 27. Di H, Nie Y, Hu X, et al. Assessment of visual fixation in vegetative and minimally conscious states. BMC Neurol 2014; 14: 147. Pistoia F, Sacco S, Franceschini M, et al. Comorbidities: a key issue in patients with disorders of consciousness. J Neurotrauma 2015; 32(10): 682-8. Howell K, Grill E, Klein AM, Straube A, Bender A. Rehabilitation outcome of anoxic-ischaemic encephalopathy survivors with prolonged disorders of consciousness. Resuscitation 2013; 84(10): 1409-15. Whyte J, Gosseries O, Chervoneva I, et al. Predictors of short-term outcome in brain-injured patients with disorders of consciousness. Prog Brain Res 2009; 177: 63-72. Born JD, Albert A, Hans P, Bonnal J. Relative prognostic value of best motor response and brain stem reflexes in patients with severe head injury. Neurosurgery 1985; 16(5): 595-601. Laureys S, Owen AM, Schiff ND. Brain function in coma, vegetative state, and related disorders. Lancet Neurol 2004; 3(9): 537-46. Schiff ND. Measurements and models of cerebral function in the severely injured brain. J Neurotrauma 2006; 23(10): 1436-49. Laureys S, Boly M, Tononi G. Functional neuroimaging. In: The Neurology of Consciousness: Cognitive Neuroscience and Neuropathology Oxford: Elsevier Academic Press. 2009; pp. 31-42. Laureys S, Peigneux P, Goldman S. Brain imaging. In: D'haenen H, den Boer JA, Willner P, Eds. Biological Psychiatry. New York: John Wiley & Sons Ltd. 2002; pp. 155-66. Magistretti PJ, Pellerin L. Cellular mechanisms of brain energy metabolism and their relevance to functional brain imaging. Philos Trans R Soc Lond B Biol Sci 1999; 354(1387): 1155-63. Tommasino C, Grana C, Lucignani G, Torri G, Fazio F. Regional cerebral metabolism of glucose in comatose and vegetative state patients. J Neurosurg Anesthesiol 1995; 7(2): 109-16. Rudolf J, Ghaemi M, Ghaemi M, Haupt WF, Szelies B, Heiss WD. Cerebral glucose metabolism in acute and persistent vegetative state. J Neurosurg Anesthesiol 1999; 11(1): 17-24. Stender J, Kupers R, Rodell A, et al. Quantitative rates of brain glucose metabolism distinguish minimally conscious from vegetative state patients. J Cereb Blood Flow Metab 2015; 35(1): 58-65. Laureys S, Faymonville ME, Luxen A, Lamy M, Franck G, Maquet P. Restoration of thalamocortical connectivity after recovery from persistent vegetative state. Lancet 2000; 355(9217): 1790-1. Thibaut A, Bruno MA, Chatelle C, et al. Metabolic activity in external and internal awareness networks in severely brain-damaged patients. J Rehabil Med 2012; 44(6): 487-94. Qin P, Wu X, Duncan NW, et al. GABAA receptor deficits predict recovery in patients with disorders of consciousness: A preliminary multimodal [(11) C]Flumazenil PET and fMRI study. Hum Brain Mapp 2015; 36(10): 3867-77. Laureys S, Faymonville ME, Peigneux P, et al. Cortical processing of noxious somatosensory stimuli in the persistent vegetative state. Neuroimage 2002; 17(2): 732-41. Laureys S, Faymonville ME, Degueldre C, et al. Auditory processing in the vegetative state. Brain 2000; 123(Pt 8): 1589-601. Boly M, Faymonville ME, Peigneux P, et al. Cerebral processing of auditory and noxious stimuli in severely brain injured patients: differences between VS and MCS. Neuropsychol Rehabil 2005; 15(3-4): 283-9. Boly M, Faymonville ME, Peigneux P, et al. Auditory processing in severely brain injured patients: differences between the minimally conscious state and the persistent vegetative state. Arch Neurol 2004; 61(2): 233-8. Ogawa S, Lee TM, Kay AR, Tank DW. Brain magnetic resonance imaging with contrast dependent on blood oxygenation. Proc Natl Acad Sci USA 1990; 87(24): 9868-72. Fox MD, Raichle ME. Spontaneous fluctuations in brain activity observed with functional magnetic resonance imaging. Nat Rev Neurosci 2007; 8(9): 700-11. Vanhaudenhuyse A, Noirhomme Q, Tshibanda LJ, et al. 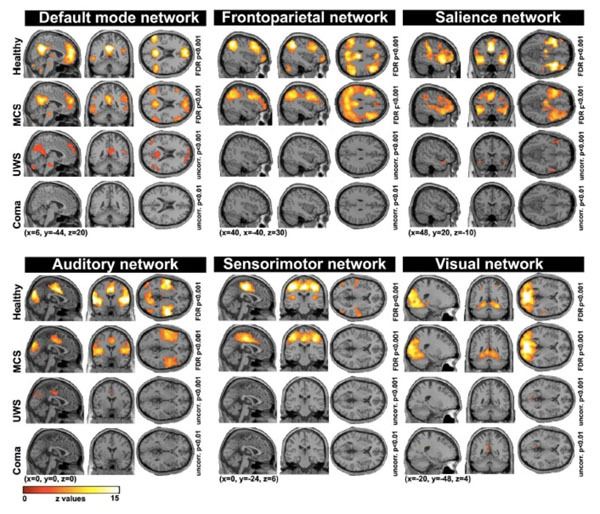 Default network connectivity reflects the level of consciousness in non-communicative brain-damaged patients. Brain 2010; 133(Pt 1): 161-71. Soddu A, Vanhaudenhuyse A, Demertzi A, et al. Resting state activity in patients with disorders of consciousness. Funct Neurol 2011; 26(1): 37-43. Huang Z, Dai R, Wu X, et al. The self and its resting state in consciousness: An investigation of the vegetative state. Hum Brain Mapp 2014; 35(5): 1997-2008. Kotchoubey B, Merz S, Lang S, et al. Global functional connectivity reveals highly significant differences between the vegetative and the minimally conscious state. J Neurol 2013; 260(4): 975-83. Ovadia-Caro S, Nir Y, Soddu A, et al. Reduction in inter-hemispheric connectivity in disorders of consciousness. PLoS One 2012; 7(5): e37238. Demertzi A, Antonopoulos G, Heine L, et al. Intrinsic functional connectivity differentiates minimally conscious from unresponsive patients. Brain 2015; 138(9): 2619-31. Qin P, Wu X, Huang Z, et al. How are different neural networks related to consciousness? Ann Neurol 2015; 78(4): 594-605. Wu X, Zou Q, Hu J, et al. Intrinsic functional connectivity patterns predict consciousness level and recovery outcome in acquired brain injury. J Neurosci 2015; 35(37): 12932-46. Coleman MR, Davis MH, Rodd JM, et al. Towards the routine use of brain imaging to aid the clinical diagnosis of disorders of consciousness. Brain 2009; 132(Pt 9): 2541-52. Di HB, Yu SM, Weng XC, et al. Cerebral response to patient’s own name in the vegetative and minimally conscious states. Neurology 2007; 68(12): 895-9. Crone JS, Ladurner G, Höller Y, Golaszewski S, Trinka E, Kronbichler M. Deactivation of the default mode network as a marker of impaired consciousness: an fMRI study. PLoS One 2011; 6(10): e26373. Wang F, Di H, Hu X, et al. Cerebral response to subject’s own name showed high prognostic value in traumatic vegetative state. BMC Med 2015; 13: 83. Owen AM, Coleman MR, Boly M, Davis MH, Laureys S, Pickard JD. Detecting awareness in the vegetative state. Science 2006; 313(5792): 1402. Naci L, Owen AM. Making every word count for nonresponsive patients. JAMA Neurol 2013; 70(10): 1235-41. Naci L, Cusack R, Anello M, Owen AM. A common neural code for similar conscious experiences in different individuals. Proc Natl Acad Sci USA 2014; 111(39): 14277-82. Monti MM, Vanhaudenhuyse A, Coleman MR, et al. Willful modulation of brain activity in disorders of consciousness. N Engl J Med 2010; 362(7): 579-89. Bardin JC, Fins JJ, Katz DI, et al. Dissociations between behavioural and functional magnetic resonance imaging-based evaluations of cognitive function after brain injury. Brain 2011; 134(3): 769-82. Lehembre R, Gosseries O, Lugo Z, et al. Electrophysiological investigations of brain function in coma, vegetative and minimally conscious patients. Arch Ital Biol 2012; 150(2-3): 122-39. Kotchoubey B. Event-related potential measures of consciousness: two equations with three unknowns. Prog Brain Res 2005; 150: 427-44. Sitt JD, King JR, El Karoui I, et al. Large scale screening of neural signatures of consciousness in patients in a vegetative or minimally conscious state. Brain 2014; 137(8): 2258-70. Bagnato S, Boccagni C, Sant’Angelo A, Prestandrea C, Mazzilli R, Galardi G. EEG predictors of outcome in patients with disorders of consciousness admitted for intensive rehabilitation. Clin Neurophysiol 2015; 126(5): 959-66. Schnakers C, Ledoux D, Majerus S, et al. Diagnostic and prognostic use of bispectral index in coma, vegetative state and related disorders. Brain Inj 2008; 22(12): 926-31. Landsness E, Bruno MA, Noirhomme Q, et al. Electrophysiological correlates of behavioural changes in vigilance in vegetative state and minimally conscious state. Brain 2011; 134(Pt 8): 2222-32. Fingelkurts AIA, Fingelkurts AnA, Bagnato S, Boccagni C, Galardi G. Dissociation of vegetative and minimally conscious patients based on brain operational architectonics: factor of etiology. Clin EEG Neurosci 2013; 44(3): 209-20. Wu DY, Cai G, Zorowitz RD, Yuan Y, Wang J, Song WQ. Measuring interconnection of the residual cortical functional islands in persistent vegetative state and minimal conscious state with EEG nonlinear analysis. Clin Neurophysiol 2011; 122(10): 1956-66. Qin P, Di H, Yan X, et al. Mismatch negativity to the patient’s own name in chronic disorders of consciousness. Neurosci Lett 2008; 448(1): 24-8. Fischer C, Luaute J, Morlet D. Event-related potentials (MMN and novelty P3) in permanent vegetative or minimally conscious states. Clin Neurophysiol 2010; 121(7): 1032-42. Höller Y, Bergmann J, Kronbichler M, et al. Preserved oscillatory response but lack of mismatch negativity in patients with disorders of consciousness. Clin Neurophysiol 2011; 122(9): 1744-54. Boly M, Garrido MI, Gosseries O, et al. Preserved feedforward but impaired top-down processes in the vegetative state. Science 2011; 332(6031): 858-62. Faugeras F, Rohaut B, Weiss N, et al. Event related potentials elicited by violations of auditory regularities in patients with impaired consciousness. Neuropsychologia 2012; 50(3): 403-18. Bekinschtein TA, Dehaene S, Rohaut B, Tadel F, Cohen L, Naccache L. Neural signature of the conscious processing of auditory regularities. Proc Natl Acad Sci USA 2009; 106(5): 1672-7. King JR, Faugeras F, Gramfort A, et al. Single-trial decoding of auditory novelty responses facilitates the detection of residual consciousness. Neuroimage 2013; 83: 726-38. Daltrozzo J, Wioland N, Mutschler V, Kotchoubey B. Predicting coma and other low responsive patients outcome using event-related brain potentials: a meta-analysis. Clin Neurophysiol 2007; 118(3): 606-14. Fischer C, Luauté J, Némoz C, Morlet D, Kirkorian G, Mauguière F. Improved prediction of awakening or nonawakening from severe anoxic coma using tree-based classification analysis. Crit Care Med 2006; 34(5): 1520-4. Steppacher I, Eickhoff S, Jordanov T, Kaps M, Witzke W, Kissler J. N400 predicts recovery from disorders of consciousness. Ann Neurol 2013; 73(5): 594-602. Cavinato M, Freo U, Ori C, et al. Post-acute P300 predicts recovery of consciousness from traumatic vegetative state. Brain Inj 2009; 23(12): 973-80. Estraneo A, Moretta P, Loreto V, et al. Predictors of recovery of responsiveness in prolonged anoxic vegetative state. Neurology 2013; 80(5): 464-70. Xu W, Jiang G, Chen Y, Wang X, Jiang X. Prediction of minimally conscious state with somatosensory evoked potentials in long-term unconscious patients after traumatic brain injury. J Trauma Acute Care Surg 2012; 72(4): 1024-9. Wijnen VJ, Eilander HJ, de Gelder B, van Boxtel GJ. Visual processing during recovery from vegetative state to consciousness: comparing behavioral indices to brain responses. Neurophysiol Clin 2014; 44(5): 457-69. Schnakers C, Perrin F, Schabus M, et al. Voluntary brain processing in disorders of consciousness. Neurology 2008; 71(20): 1614-20. Cruse D, Chennu S, Chatelle C, et al. Bedside detection of awareness in the vegetative state: a cohort study. Lancet 2011; 378(9809): 2088-94. Pistoia F, Carolei A, Iacoviello D. EEG-detected olfactory imagery to reveal covert consciousness in minimally conscious state. Brain Inj 2015; 29: 1729-35. Pistoia F, Sarà M. Complexity loss in physiological time series of patients in a vegetative state. Nonlinear Dynamics psychol like sci 2010; 14: 2-13. Sarà M, Pistoia F, Pasqualetti P. Functional isolation within the cerebral cortex in the vegetative state: a nonlinear method to predict clinical outcomes. Neurorehabil neural repair 2011; 25: 35-42. Sarà M, Sebastiano F, Sacco S. Heart rate non linear dynamics in patients with persistent vegetative state: a preliminary report. Brain Inj 2008; 22: 33-7. Hallett M. Transcranial magnetic stimulation and the human brain. Nature 2000; 406(6792): 147-50. Massimini M, Boly M, Casali A, Rosanova M, Tononi G. A perturbational approach for evaluating the brain’s capacity for consciousness. Prog Brain Res 2009; 177: 201-14. Casarotto S, Romero Lauro LJ, Bellina V, et al. EEG responses to TMS are sensitive to changes in the perturbation parameters and repeatable over time. PLoS One 2010; 5(4): e10281. Pistoia F, Sacco S, Carolei A, Sarà M, et al. Corticomotor facilitation in vegetative state: results of a pilot study. Arch Phys Med Rehabil 2013; 94: 1599-606. Rosanova M, Gosseries O, Casarotto S, et al. Recovery of cortical effective connectivity and recovery of consciousness in vegetative patients. Brain 2012; 135(4): 1308-20. Ragazzoni A, Pirulli C, Veniero D, et al. Vegetative versus minimally conscious states: a study using TMS-EEG, sensory and event-related potentials. PLoS One 2013; 8(2): e57069. Casali AG, Gosseries O, Rosanova M, et al. A theoretically based index of consciousness independent of sensory processing and behavior. Sci Transl Med 2013; 5(198): 198-05. Giacino JT, Whyte J, Bagiella E, et al. Placebo-controlled trial of amantadine for severe traumatic brain injury. N Engl J Med 2012; 366(9): 819-26. Fridman EA, Krimchansky BZ, Bonetto M, et al. Continuous subcutaneous apomorphine for severe disorders of consciousness after traumatic brain injury. Brain Inj 2010; 24(4): 636-41. Clauss RP, Güldenpfennig WM, Nel HW, Sathekge MM, Venkannagari RR. Extraordinary arousal from semi-comatose state on zolpidem. A case report. S Afr Med J 2000; 90(1): 68-72. Whyte J, Rajan R, Rosenbaum A, et al. Zolpidem and restoration of consciousness. Am J Phys Med Rehabil 2014; 93(2): 101-13. Pistoia F, Sacco S, Sarà M, Franceschini M, Carolei A. Intrathecal baclofen: effects on spasticity, pain, and consciousness in disorders of consciousness and locked-in syndrome. Curr Pain Headache Rep 2015; 19(1): 466. Angelakis E, Liouta E, Andreadis N, et al. Transcranial direct current stimulation effects in disorders of consciousness. Arch Phys Med Rehabil 2014; 95(2): 283-9. Louise-Bender Pape T, Rosenow J, Lewis G, et al. Repetitive transcranial magnetic stimulation-associated neurobehavioral gains during coma recovery. Brain Stimulat 2009; 2(1): 22-35. Manganotti P, Formaggio E, Storti SF, et al. Effect of high-frequency repetitive transcranial magnetic stimulation on brain excitability in severely brain-injured patients in minimally conscious or vegetative state. Brain Stimulat 2013; 6(6): 913-21. Schiff ND, Giacino JT, Kalmar K, et al. Behavioural improvements with thalamic stimulation after severe traumatic brain injury. Nature 2007; 448(7153): 600-3. Schnakers C, Hustinx R, Vandewalle G, et al. Measuring the effect of amantadine in chronic anoxic minimally conscious state. J Neurol Neurosurg Psychiatry 2008; 79(2): 225-7. Brefel-Courbon C, Payoux P, Ory F, et al. Clinical and imaging evidence of zolpidem effect in hypoxic encephalopathy. Ann Neurol 2007; 62(1): 102-5. Chatelle C, Thibaut A, Gosseries O, et al. Zolpidem effect on recovery of consciousness: a FDG-PET study. Front Hum Neurosci 2014; 8: 917. Williams ST, Conte MM, Goldfine AM, et al. Common resting brain dynamics indicate a possible mechanism underlying zolpidem response in severe brain injury. eLife 2013; 2: e01157. Machado C, Estévez M, Pérez-Nellar J, et al. Autonomic, EEG, and behavioral arousal signs in a PVS case after Zolpidem intake. Can J Neurol Sci 2011; 38(2): 341-4. Pistoia F, Sarà M, Sacco S, Franceschini M, Carolei A. Silencing the brain may be better than stimulating it. The GABA effect. Curr Pharm Des 2014; 20(26): 4154-66. Schiff ND. Recovery of consciousness after brain injury: a mesocircuit hypothesis. Trends Neurosci 2010; 33(1): 1-9. Piccione F, Cavinato M, Manganotti P, et al. Behavioral and neurophysiological effects of repetitive transcranial magnetic stimulation on the minimally conscious state: a case study. Neurorehabil Neural Repair 2011; 25(1): 98-102. Cincotta M, Giovannelli F, Chiaramonti R, et al. No effects of 20 Hz-rTMS of the primary motor cortex in vegetative state: A randomised, sham-controlled study. Cortex; a journal devoted to the study of the nervous system and behavior 2015; 71: 368-76. Giacino J, Fins JJ, Machado A, Schiff ND. Central thalamic deep brain stimulation to promote recovery from chronic posttraumatic minimally conscious state: challenges and opportunities. Neuromodulation 2012; 15(4): 339-49. Yamamoto T, Katayama Y, Kobayashi K, Oshima H, Fukaya C, Tsubokawa T. Deep brain stimulation for the treatment of vegetative state. Eur J Neurosci 2010; 32(7): 1145-51. Guerra A, Costantini EM, Maatta S, Ponzo D, Ferreri F. Disorders of consciousness and electrophysiological treatment strategies: a review of the literature and new perspectives. Curr Pharm Des 2014; 20(26): 4248-67. Bodart O, Laureys S, Gosseries O. Coma and disorders of consciousness: scientific advances and practical considerations for clinicians. Semin Neurol 2013; 33(2): 83-90.